Get more out of your weight loss plan on the honey diet to lower food calories helping you lose weight. The honey diet ("Hachimitsu-diet") where all you have to do is stop using sugar using pure honey instead. 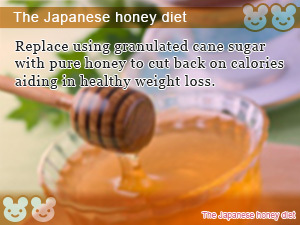 As for weight loss diets that work there is no better proof than Japanese honey. As expensive as buying honey is in Japan is people keep pulling it off the shelves carefully inserting it into their eco-friendly grocery carts because they how good it is for the body and losing weight. By substituting the sugar you are so very used to using in cooking and perhaps a cup of coffee with pure honey you can start enjoying the many benefits of the honey diet right away. Compared to cane sugar derived sweeteners honey is low calorie while differing in many levels of sweetness. Is honey going to help me lose weight? Honey gives you a measure you can use to control calorie intake without giving up on sweetening your favorite food and drinks. In addition, the vitamins and minerals you get from eating honey help clean your body from deep within making healthy weight loss possible. In this next Slism, we will introduce how you can reduced calories in your diet just by switching over your sweetener on the honey diet going into detail on why the honey is so good for your body following up with areas you must watch out for too prevent your honey diet form going stale before you see results. High calorie sugar is something you have to hold back on especially when you are on a diet. The honey diet is when you use pure honey instead of sugar dipping your sweeteners into the low calorie zone reducing calories in your diet without losing your sweet tooth. Going on the honey diet is so simple it's sick! All you have to do is use honey instead of cane sugar as a sweetener that you use eating your favorite sweets and in cooking. That's it. For example, switch up- your desert to healthy bowl of yogurt with honey. This alone give your what your need to calorie-down without giving up on your need to snack while including balanced nutrition to your diet. When adding honey to your favorite drinks, it is recommended that you not add honey to drinks containing caffeine including coffee, most teas, and energy drinks. Caffeine blocks the absorption of iron contained in honey by your body which is such a waist, considering the amount of iron contained in honey. The recommended daily amount of sugar you should be getting in your diet is between 20 and 50 grams. Due to the face that honey is in liquid form it only contains 70 to 80 percent of the sugar in cane sugar. In addition, fructose contained in honey is sweeter than cane sugars so you don't have to use as much to attain the save level of sweetness making it easy to cut down the calories from using sweeteners in your diet. The honey does doesn't have any rules regarding strict eating restrictions or low calorie requirements, which is why it is said to be such an easy diet to continue in lifelong health practice. For people already on a diet, doing the honey diet in conjunction with the diet your are already on makes a great complement helping your lose weight. There are all kinds of different types of honey to choose from. One that sticks out from the rest is acacia honey made from bees that pollenate on the acacia plant. Honey is made up of fructose, grape sugar and other simple sugars. 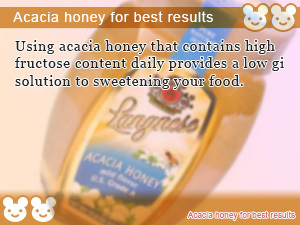 Acacia honey contains more fructose than other honeys helpful in keeping your blood sugar level down. Among being abundant in nutrition, honey has long been loved by health practitioners for the good that it does for your body. Honey has a probiotic effect on the body increasing the number of Bifidobacterium ("Good bacteria") in your intestines helping your body get rid constipation, fatigue, dry skin, along with many other health and beauty benefits you can look forward to while incorporating more honey in your diet. Honey contains fewer calories than cane sugar and requires less to attain the same level of sweetness making an excellent tool to effectively control the amount of calories in your diet in addition to acting as a natural fat blocker while increasing the ability for your body to burn off unwanted calories. Eating honey is not only good for you but is also low in calories making an excellent tool in ensuring your diet works out the way you want it to succeeding. Eating Sweet Honey Is Good For You? The sugars contain in honey are easy to digest requiring less time than can sugars and other high calorie sweeteners. In addition to being easily digestible eating honey is safe when you are worried about your blood sugar spiking causing energy to be stored away as fat improving your metabolism to convert the food you eat into energy with less waste. Honey contains the short-chain fatty acid, Gluconic acid that helps your body burn off more calories whereas normal carbs get turned into fat before being burned by your body. Gluconic acid in your liver allows sugars and fat to be effectively burnt at the same time. 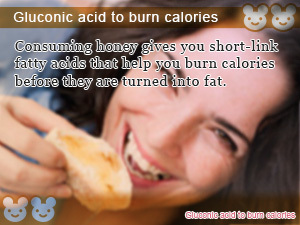 Surely getting more Gluconic acid in your diet through honey helps your burn more calories reducing body fat over time. Honey is an excellent source of iron, calcium, potassium and B vitamins essential nutrition that is important in any diet whether you are an avid dieter or not. The vitamins and minerals contained in honey are easily absorbable by your body which ensures proper nutrient absorption hammering down on nutrition in your diet helping clean up your body from the inside out. Honey is said to contain 294 calories per 100 gram serving size. Compared to cane sugar (384 Cal / 100g) honey gives you wiggle room when deciding how sweet you want to make your favorite foods. However that doesn't mean you can ignore how much you consume in your diet. Like anything else, moderation is the key to doing it right. A good rule of thumb when deciding how much honey to use in substitution of cane sugar is for every 3 spoons of sugar use 1 spoon of honey. Of course, adding a whole spoon of honey would be going a little overboard but it doesn't hurt to give an example. Fructose contained in honey when exposed to heat loses its sweetness possible affecting the amount of honey you use to attain the sweet taste you are looking for. When using honey in cooking it's also important to use honey with lower levels of fructose content to reduce the effect heat exposer has on the sweetness of your cooking. Replace using granulated cane sugar with pure honey to cut back on calories aiding in healthy weight loss. Consuming honey gives you short-link fatty acids that help you burn calories before they are turned into fat. Using acacia honey that contains high fructose content daily provides a low gi solution to sweetening your food.